by storm. Now they are looking to take on the smartphone market with their Mark 1 android smartphone. Let’s have a look at their effort to mobilize the smartphone market and see if it really stands out in the highly competitive and saturated Indian smartphone market or it is just a marketing gimmick. It is a decent looking mid-range smartphone with impressive specs sheet and some creative insights. 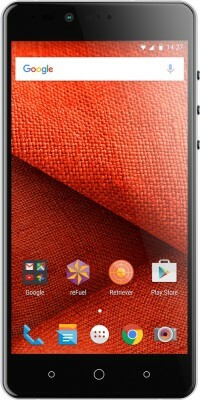 The device runs on Fuel OS, which is almost a stock android 5.1.1 but offers a few customization options. 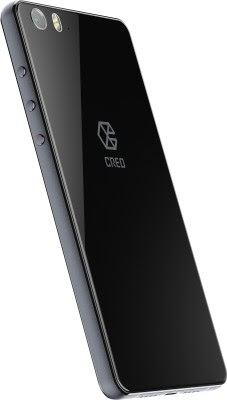 Creo is promising software updates every month on the basis of user’ssuggestions and feedback in order to improve the overall smartphone usage experience, which in itself is an innovative effort in gaining the consumer’s faith in the startup. While Creo is trying to differentiate itself on the software front, its Mark 1 doesn’t make a mark on the design front. Its quite a letdown, considering the fact that it is the design of a smartphone that captures our imagination before turning in on and getting into the nitty gritty of its software and user interface. The device brings nothing new to table on the design aspect and it appears to be a thick rectangular block. At 190 grams, the device feels quite heavy for everyday usage and is a strict no for users looking for a device capable of one-hand usage. The device sports a grey aluminium frame that runs along the sides and houses three round buttons that sit on the right side of the phone. The aluminium frame has been given a matte finish, which adds a premium feel to the Mark 1. The round power and volume rocker keys provide good tactile feedback. The left side of the phone houses a micro SIM slot and hybrid nano SIM slot. The hybrid nano SIM slot is swappable with a micro SD card upto 128 GB for additional storage space. The upper part of the frame houses a 3.5mm headphone jack. The bottom part of the frame houses a standard micro-USB slot along with two speaker grills on both side of the micro-USB slot. The front and rear side of the handset sports Corning Gorilla Glass 3 which protects the device from accidental damages, but makes it prone to finger-prints and smudges. Thanks to the gorilla glass, the device is very slippery and is tough to handle without a cover. Creo also provides an option to laser-engrave your name or a short phrase on the side bezel of the device, which is quite neat and creative. The rear side sports a 21MP camera positioned on the top-left corner along with a dual-tone LED flash and the centre has the Creo branding embossed in grey colour. On the hardware front, the Creo Mark 1 packs quite a punch with its impressive set of specs. For a mid-segment flagship, the Mark 1 ticks all the necessary boxes with a 5.5 inch rich quad HD 2560x1440px resolution display offering pixel density of 534 PPI with Corning gorilla glass 3 and rounded 2.5D glass , it is equipped with a capable MediaTek Helio X10 octa-core processor clocked at 1.95GHz, a PowerVR G6200 GPU and 3GB RAM. For storage, the Creo Mark 1 offers 32 GB internal memory, out of which 25 GB is available as user storage. The internal memory can be extended upto 128 GB by a micro SD card using the hybrid nano SIM slot which I mentioned earlier. For a device having this kind of hardware requires some serious power and Creo addresses it by a 3100mAh battery with fast charging capability that lasts a day of regular usage. The Creo Mark 1 is equipped with 21MP rear shooter, which is packed with Sony Exmor IMX230 image sensor with phase detection auto focus (PDAF). The camera is capable of recording 4K videos and also records slow motion videos at 120 fps. Another added feature is the 3D photo feature, where you need to move the camera 180 degrees around keeping the object in the centre. The result provides a 3D image of the object. On paper, the camera looks pretty good, but in real-life scenarios, the 21MP camera manages to produce good photos outdoors and in good light, but is inconsistent and there is too much noise for liking in low light. The Mark 1 sports a 8MP front camera which turns out decent photos and selfies under ample light, but struggles under low light. Unlike a lot of other brands that add heavy overlays on top of Android, Creo takes a different and a refreshing approach with their Fuel OS and Mark 1. Fuel OS is based on Android 5.1.1 and looks like stock android, but it packs in a lot of useful software customizations that are the Mark 1’s highlights. Creo promises to provide a new update every month and users can provide feedback and suggestions based on which Creo will improve or add features to their device with every update. The main highlights of Creo Mark 1’s software are its Sense, Retriever and Echo features. Let’s have a look at these features one by one. The Sense feature enables us to search for anything on the phone whether it’s a phonebook contact, a calendar event, an app, an mp3 file or any other downloaded file by just double- tapping the home button from anywhere or whatever we are doing on the device, be it browsing the web, watching a movie, playing a game or are within an app and its pretty quick and responsive and quite useful feature. The Retriever is an anti-theft feature built into the Mark 1. If the device is stolen or lost, an email containing the current location and a part of the mobile number (if SIM is replaced) is sent to the Original user. The owner can then approach Creo Customer Support along with a copy of the FIR to get the complete mobile number. The best part is this feature works without an active internet connection and even after a factory reset. The Echo is an answering machine built into the Mark 1, which automatically answers the call and informs the caller that the user is unable to take the call for the moment and they can leave their message. This feature works without operator intervention or internet and is quite useful considering whenever we are in a meeting or attending an event and don’t wish to attend a call and the caller can record the message without the hassle of calling again and again to get the message through to the user.